ZM is fully aware that the current stage of the Company, effectively reaching the standards required by the market, is associated with a factor of particular importance: the Quality. Through combined investments in staff training, acquisition and development of new technologies the company succeeds in providing products of high reliability. Actions in the quality context include to maintain multidisciplinary teams engaged in all stages of product development. Associated to them are used statistical techniques, analyses of reliability, accelerated tests, as well as the support instruments like the softwares CAE / CAD / CAM. The goals and efforts aimed at extending the concept of Quality in all aspects of the Company activity. All factors are considered. Since those that focus directly on the product as raw material, technology and professional qualification, and those which do indirectly, including the quality of life of employees. 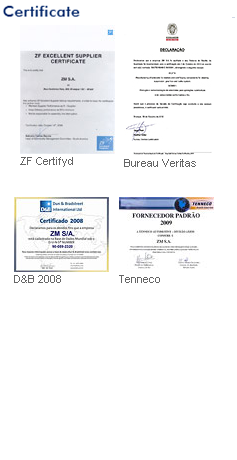 So, for ZM the term quality does not cover only their products, but the entire dynamic context that generated them.